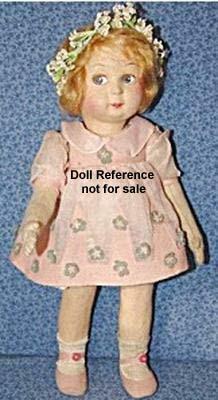 The Alma Doll Company operated approximately from 1929 until 1933 in Torino, Italy. Their felt cloth child or character dolls are Lenci look a like competitors and are equally well constructed, have elastic strung limbs, molded felt head with painted facial features, gathered and folded felt applied ears, mohair wigs and came wearing wonderful costumes. Alma dolls are usually marked with a cloth label Creation Alma Made in Italy or on the bottom of a foot Alma.